Titans coach Mike Munchak carries a 22-26 record through three seasons in Nashville. NASHVILLE, Tenn. While NFL’s Black Monday provided five coach firings, one of them wasn’t Titans coach Mike Munchak. That’s not to say that a decision on Munchak’s return to a fourth season in 2014 has been determined, though. New Titans president and CEO Tommy Smith stated he would wait until after the season to meet with Munchak and general manager Ruston Webster about the future of the team. Those discussions are expected to occur this week with an answer on Munchak’s status to come soon after. 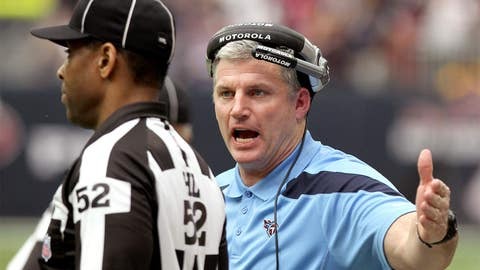 On Monday, Munchak stated his case for a return after the Titans concluded a 7-9 season with consecutive wins over AFC South rivals Houston and Jacksonville. "We won one more game, which wasn’t the goal," said Munchak, who’s 22-26 as Titans coach. "You need to win more than that. … The only important ranking is we obviously didn’t make the playoffs." But Munchak did note the broad list of improvement in various offensive and defensive statistical categories. Also of note was that starting quarterback Jake Locker missed nine games and was replaced by veteran Ryan Fitzpatrick. "Statistically, every stat you can come up with pretty much as far as numbers, we improved upon on offense," he said. "The biggest one for me was time of possession. I think it went from 32nd to middle of the pack to 16. That was a big thing we talked about with controlling the ball, controlling the line of scrimmage, keep the defense off the field. I thought that was a lot better." Another big change came from a defense that gave up the most points (29.4 points per game) in the NFL last season while setting a franchise record for scoring defense futility in the process. This season, they finished in the middle of the pack at 16th overall in scoring defense (23.8). "Defensively, the numbers were real bad last year, statistically," Munchak said. "All those numbers are obviously much, much better as far as points, rankings, where we ended up." While they improved by a single win and were in playoff contention until Week 15, the bottom line is the Titans didn’t make the postseason for a fifth straight season. "The plan was to be playing this weekend," Munchak said of the upcoming playoffs. "Good things have happened, no doubt, and players had some of their best years. I thought we improved in a lot of areas, and all that stuff’s good. But the bottom line, as we all know, is we need to be playing this weekend." Another area the Titans showed individual improvement was having a player make the Pro Bowl for the first time since 2010. Fourth-year cornerback Alterraun Verner was selected to his first Pro Bowl after finishing tied for fifth in the NFL with five interceptions. While there is a lot of conversation whether Munchak and players like running back Chris Johnson, strong safety Bernard Pollard and receivers Kenny Britt and Nate Washington will return, Verner’s stock has risen dramatically. Recently, he stated a willingness to test the open market to assess his value after fulfilling the final year of his rookie contract. "It is a huge honor," said Verner, a 2010 fourth-round draft pick out of UCLA who totaled five interceptions his first three seasons. "It is something that everybody in my family, we used to watch the (Pro Bowl) and admire the people that make it. So to know that I am going to be a part of it, and that only a special group of people make this game, is very exciting. It is a good cap-off to the season, and I am excited to be able to represent the Titans." The last time they were represented in the Pro Bowl in 2010, the Titans had four players make the squad. Three players — Johnson, free safety Michael Griffin and returner Marc Mariani (who spent 2013 on injured reserve) — are still on the roster. Former defensive end Jason Babin, now with Jacksonville, also made team. After finishing 7-9, the Titans know which teams they will play next season other than their regular AFC South home-and-home opponents of Indianapolis, Houston and Jacksonville. The Titans will host Cleveland, Pittsburgh, Dallas, New York Giants and New York Jets next season. Outside of the division, they play road games at Baltimore, Cincinnati, Kansas City, Philadelphia and Washington. Game dates and times will be released by the NFL in the spring. NFL Kickoff 2014 Weekend gets under way with a game on Thursday, Sept. 4. The regular season concludes on Sunday, Dec. 28. Super Bowl XLIX will be played in Glendale, Ariz., on Sunday, Feb. 1, 2015. The Titans also know they will select 11th in the first round of the NFL Draft to be held in May. They also select 10th (42nd overall) in the second round. Titans kicker Rob Bironas, one of the most-accurate kickers in NFL history, made 25 of his 29 field goal attempts (86.2 percent) and all 41 extra-point attempts this season. His season total of 116 points was 10th-highest in franchise history. He now owns half of the team’s top 10 scoring seasons. In Sunday’s win over Houston, the ninth-year kicker made field goals of 42 and 55 yards in the first half and 37 yards in the second half. The 55-yarder was the fourth-longest in franchise history, trailing his team record of 60 yards set in 2006. Bironas now has four field goals of 55 yards or more, and he entered the game as the third-most accurate kicker in NFL history from 50 yards or longer. Eight players who have been on the team’s practice squad this season signed future contracts Monday with the Titans. The group included offensive tackle Jeff Adams (Columbia), defensive tackle Chigbo Anunoby (Morehouse), cornerback George Baker (South Florida), defensive end Adewale Ojomo (Miami, Fla.), center Tyler Horn (Miami, Fla.), tight end Adam Schlitz (Emporia State) and linebackers Brandon Copeland (Penn) and Jonathan Willard (Clemson). Other than Anunoby, all the other signees finished the season listed on the Titans’ practice squad roster. He finished the season on the team’s practice squad/injured list.